Zippo lighters attract a lot of collectors which are willing to pay top dollar for the rarest examples. 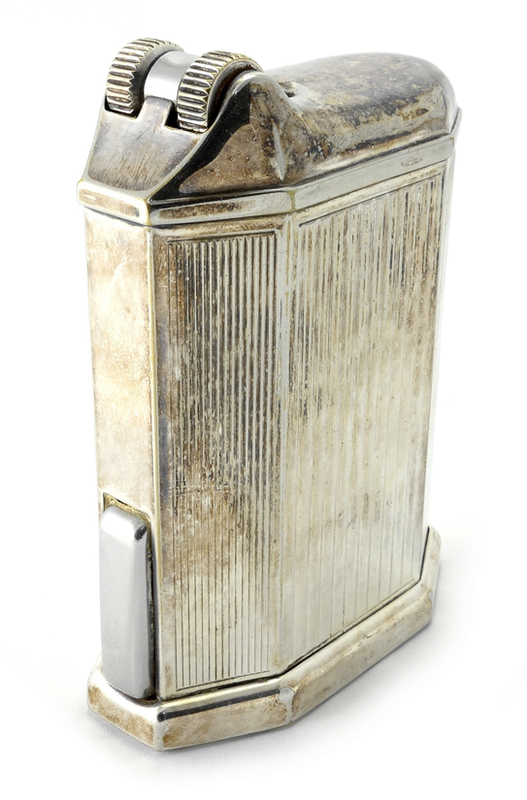 Yesterday a rare Tall (2 7/16”) early 1933 Zippo with the three barrel outside hinge was sold for $12,807. The opening bid started at $9.99 on January 3th 2014. Ten days later (13/01/2014) the lighter received a total of 64 bids from 27 bidders. Girl of the Hour Table Lighter. The Flaminaire Gentry Desk/Table Lighter was the first gas lighter in the world to be sold commercially. The manufacturing started in Paris, France in 1947 and lasted till 1951. The lighter itself was presented to the wide audience at the Hotel Crillon in Paris on 19th of June 1947. 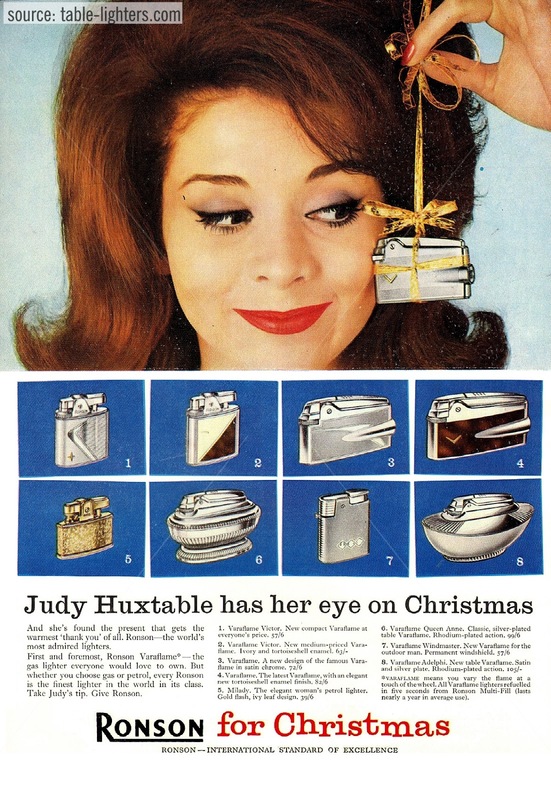 The appearance of a new lighter concept was accompanied by full page magazine advertisements. The lighter itself was very expensive – 20,000 Francs (average French salary) and only few could afford it. The best markets for the Gentry except France were the United Kingdom and USA. The marketing success of the Gentry and other models made by Flaminaire like Baronet began a new era in the lighter industry. The manufacturers were starting to switch from gasoline to gas which involved new inventions that allowed among others to resign from the factory made "butagaz" tanks used by the Gentry. 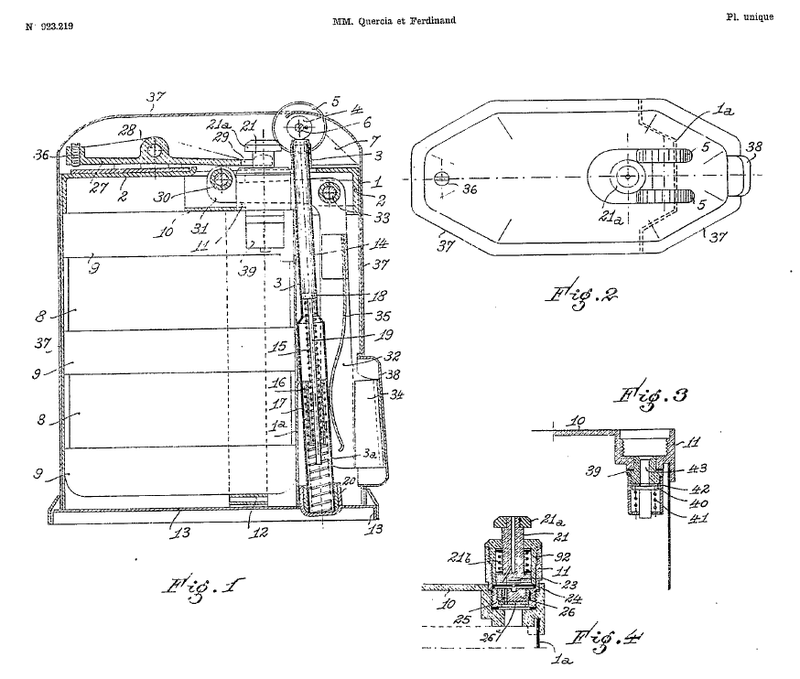 The Gentry lighter was based on Pingeot patent dated March 21, 1935 which was sold to Marcel Quercia. After the II World War M. Quercia together with the Shell corporation started to refine and manufacture the idea of Pingeot. Soon the Buta-bloc lighter was born, so named to identify the lighter’s butane gas refill system which was patented in France in 1946 (patent no. FR 912414-A). The design of the Flaminaire was patented a year later in Jul, 1 1947 by Marcel Quercia and Georges Ferdinand (patent no. 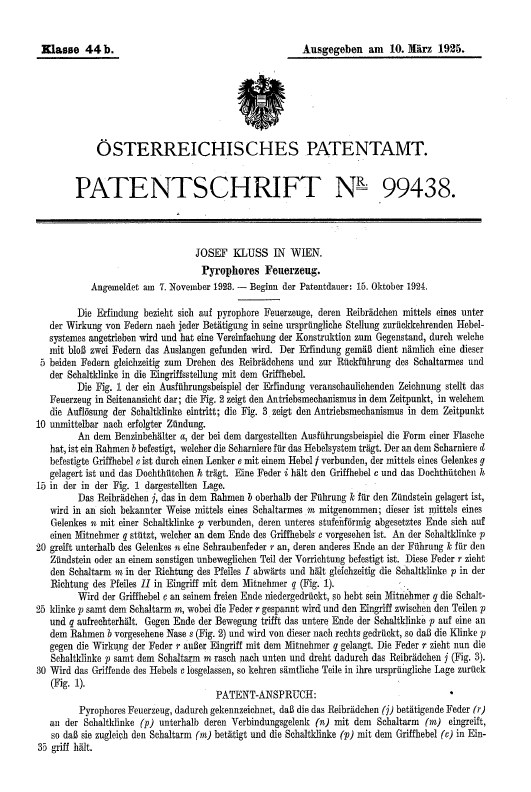 FR 923219-A, see below). Gold plate combined with pearl brown lacquer (very rare, from 1949). Silver plate combined with black lacquer (rare). Silver plate with dotted texture (rare). Silver plate with vertical stripes (rare, see picture). Silver plate mainly covered with alligator skin (rare). The gas tank allowed according to Flaminaire for 10000 lits. And if the gas tank was empty you had to buy another one. If you want to dismantle the lighter this video might be helpful. 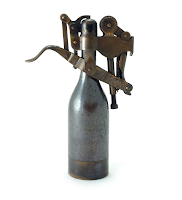 The pyrophoric lighter designed by Josef Kluss in Wien and patented in Austria in 1925 was used by Steele & Johnson of Waterbury to produce the Capitol Lighter which was a success in the US. 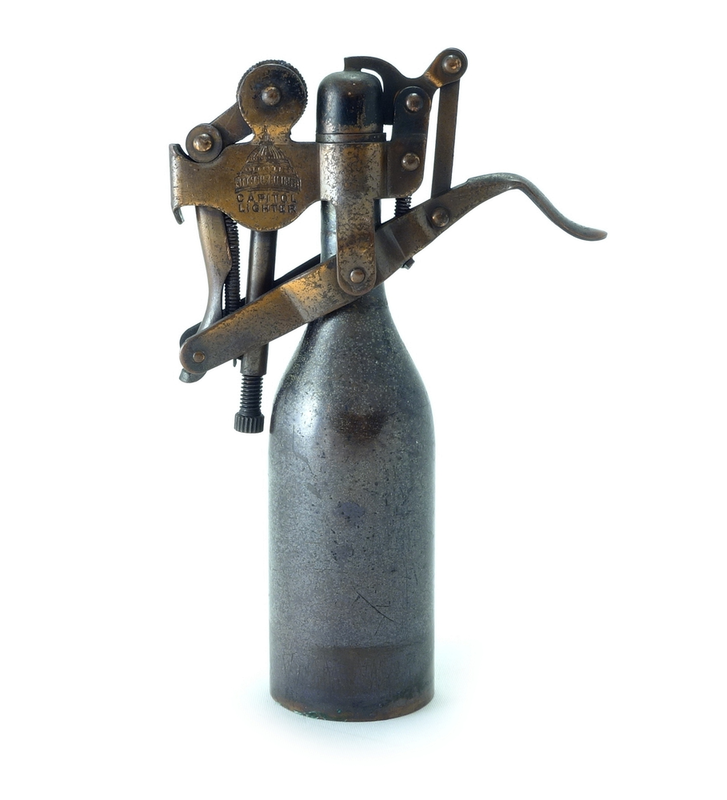 The Capitol Lighter was manufactured between 1927 and 1931 by Steele and Johnson in Waterbury (Connecticut) in the United States of America. 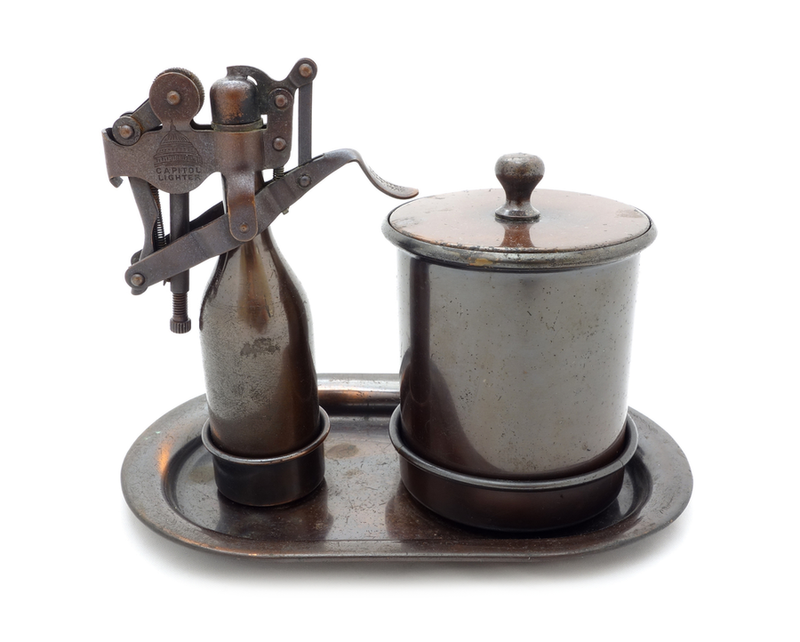 The company was founded in Waterbury in 1851 and manufactured brass and other metal goods. The firm opened a New York shop in 1865 and ceased operation in 1933. This unusual brass/bronze table lighter features a mechanical snap up levered mechanism. 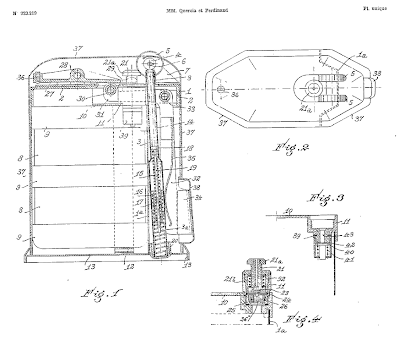 The mechanism as well the design of the lighter were invented and patented on the 10th of March 1925 (patent no. 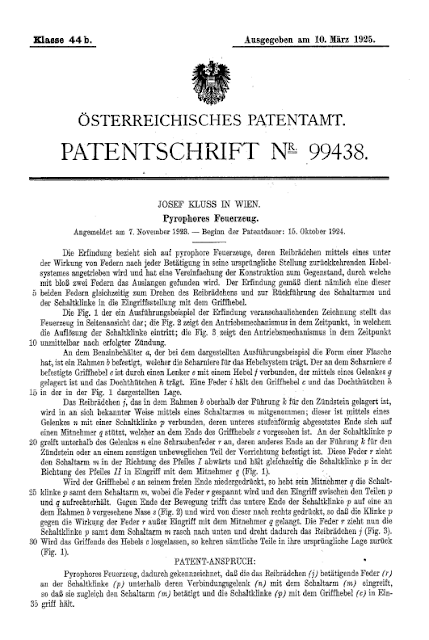 AT99438) by Josef Kluss of Vienna in Austria. The fact that Steele & Johnson Mfg. 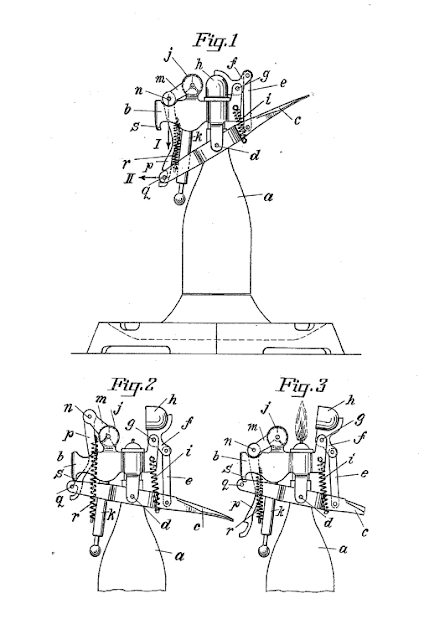 Co. used the patent filled by George S. Eldred on 17th September 1912 in the USA (patent no. 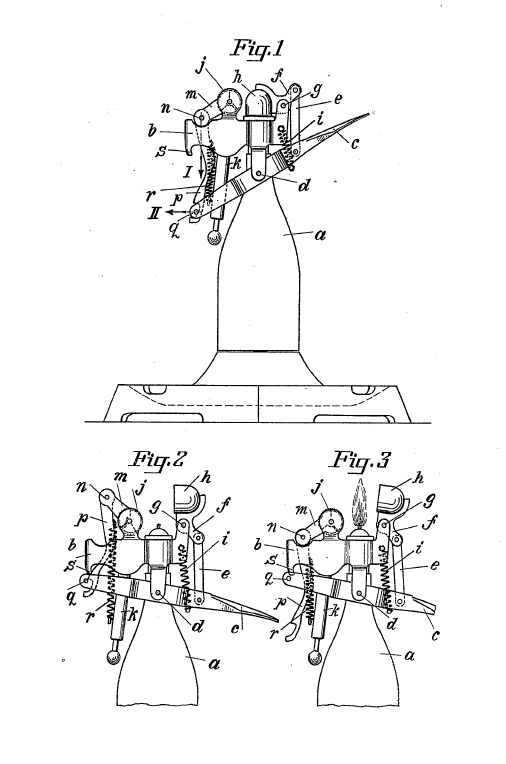 US1038735) is unfounded as it features a absolutely different mechanism (semi-automatic). This automatic petrol lighter is one of the most desired lighters by collectors because of the fairly complicated and interesting mechanism. 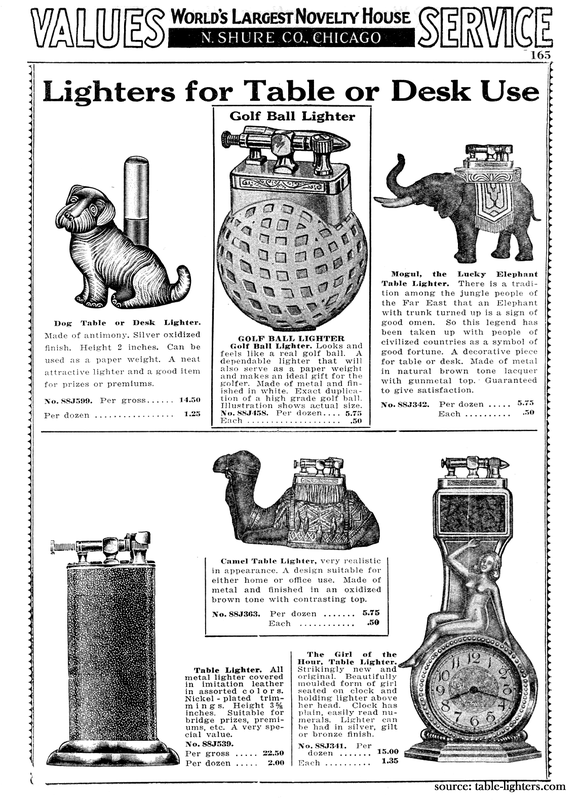 The Capitol Lighter was manufactured in many different configurations (lighter with ashtray – both table and floor, lighter with a tray and cigarette holder etc.). Also the choice of finishes was quite impressive: plain brass, bronze, nickel plate and painted in three basic colors: red, green and yellow which was the most common one). Steele & Johnson Mfg. Co. Waterbury Conn.
New York Office 290 Madison Ave. The lighter was also manufactured for Gerlach Barklow Co. which was one of the largest calendar and advertising companies in America. It was marked "G.B. Co. Joliet ILL." rather then "Capitol Lighter".